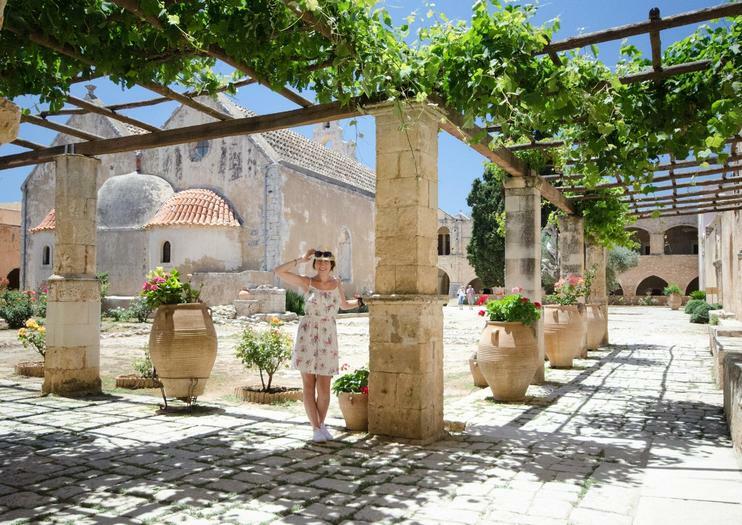 Perched on a 500-meter high plateau with a backdrop of hillside vineyards, ancient olive groves and the distant peak of Mt Ida, it’s easy to see why the Arkadi Monastery draws so many visitors. The unique building, with its blend of Renaissance and Greek style architecture, fairytale turrets and dramatic central bell tower, has the presence of a fortress rather than a church, and behind its attractive façade lies a long and bloody history. Built in 1587 on the site of a 13th-century Byzantine church, Arkadi Monastery is most famous for its role during the 1866 rebellion, when around 900 women, children and guerrilla fighters took refuge in the monastery and were held under siege by Turkish troops. Despite holding out for nine days, the monastery eventually fell to the Turks, but today, the monastery is treasured as a National Monument and an important reminder of the fight for Cretan independence. Arkadi Monastery is located in central Crete, 25 km southeast of Rethimnon and is open daily from 9am-6pm. Get a taste for the idyllic scenery, customs, and culture of the Cretan countryside 11-hour sightseeing trip with a small group. Travel to areas few tourists ever see as you visit the historic Monastery of Arkadi, learn to bake bread in a picturesque mountain village, take a hike through a beautiful gorge, and much more. Lunch, a light dinner, snacks, coffee, and transport are included. Immerse yourself in Crete's culture with this journey from Patsos. Throughout the course of your day, you'll visit the pottery village of Margarites Gorge and the Eastern Orthodox Monastery of Arkadi before heading over to the beautiful St. Anthony Gorge for a bit of hiking. You'll then stop for a traditional tavern lunch before heading back. The Real Crete:On this excursion you will have the opportunity to see many places that represent the traditional lifestyle and some historical facts of Crete. The first stop is at Melidoni Cave which is a cave full of history and dates back to Neolithic Period based on tools and items found it the cave. The second stop is at the village of Margarites. Margarites is famous for its pottery that goes back many generations. The third stop is at the Museum of Eleftherna before you get to the Arkadi Monastery. The Arkadi Monastery is the oldest monastery in Crete. You then continue on the village of Apostoli.Here you will visit an old olive oil factory and see how the production of our olive oil is made. In this village you will also eat in a traditional tavern whilst enjoying the beautiful sound of live Creta music. The second last stop is at Saint Antonios Gorge for photos and finally the last stop which is the Dam known as "Fragma Potamon" which is the home of many animals and flowers. Olive oil tasting under the shade of olive trees. Tasting and olive oil stories through centuries, at the monumental olive groove in the center of Amari Valley area, near the Byzance Church. An unique experience of olive oil tasting, outdoor. activity seminar. We try 3 differents olive oil extra virgin produced in differents areas of Crete. We learn about the Cretan olive oil culture and useful tips about hight quality Olive oil. The seminars lasts aprox 2 hours in the amazing olive grove in Amari. We walk among the olive trees drinking some of the best olive oils in Crete, We end by a free pairing food and traditional raki. This Private tour in Crete is a unique opportunity to feel the Cretan hospitalityYou will walk at the narrow streets of old town of Rethymno, at narrow alleys, kiosks (prominent wooden windows), amateur lyres, mantinadas, smell of fresh bread from wood ovens and tsikoudia flavor. In other words, one of the latest authentic magical tour in CreteYou will visit the Lake of Kourna, that the landscape is lovely and relaxing, whether you want to go for a walk in the countryside with unique natural beauty. We will enjoy our coffee break here and you will have memorable photosOur next stop will be at the Arkadi Monastery, as it is the most historic monastery of Crete and it has been designated by UNESCO as a European Freedom Monument. Finally, we will reach at the most traditional village in Crete, located in picturesque green rolling hills the village is well known for its pottery, called "Margarites". Being the most important center of ceramics industry in Crete this is the must-see. Margarites Village, located between green rolling hills. The village is well known for its pottery which the visitor can purchase along with other items of traditional art – local craft shops are open to welcome tourists. Margarites are worth exploring by walking through the village, you will see beautifully decorated doors and walls, which date from the period of the Venetian occupation.The Monastery of Arkady is surrounded by a strong wall that made it impregnable by the enemies. It is surely the most historic monastery of Crete, it is the sacred symbol of the fight for freedom. In fact, the UNESCO has declared Arkadi a European Monument of Freedom.Rethymnon City is a fascinating walking tour through the narrow winding streets of Rethymnon, the old houses with their wooden covered balconies, the Venetian and the Turkish monuments. Rethymno combines rarely united features: the old town’s charm and history, with proximity to a long sandy beach. This excursion is considered to be an experiential, spiritual and cultural experience. Traveler throughout the visit in Arkadi Monastery can see its unique natural beauty, learn the prestigious history, hear the numerous legends deeply rooted in the time, and admire the its heirlooms and thesaurus richness. The next visit and the main destination is Margarites, which is a small and picturesque village famous for its pottery art. The tradition of pottery goes back many generations in this village and guests will be able to be a part of the procedure and a local will show them how the pots are hand thrown. After the pottery class guests will have the chance to taste the Cretan cuisine in a local taverna in the center of the village. Arkadi monastery is the most famous monastery on Crete and it’s a symbol not only of the island but of the entire Greece. During this time it played an important role since it was used as a shelter for more than 1000 people, most of them women and children. You can learn about the history of this place on its territory and, of course, see wonderful architecture that remained untouched. Eleftherna is an ancient city which flourished from Homer times to the very end of Byzantine Empire. It’s located in a very picturesque place - up the highest mountain of Crete, mount Ida. Excavations started here in the 80s and revealed great structures of the city. And the last place we’ll visit during our tour will be Margarites Village. Located in picturesque green rolling hills of the Rethymnon region, the village is well known for its pottery. The village, which has some extraordinary architecture and lovely narrow winding streets, is well worth exploring.